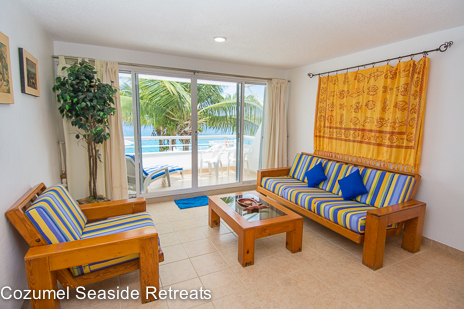 Miramar Condo 204 for rent Oceanfront Condo in Cozumel Island. 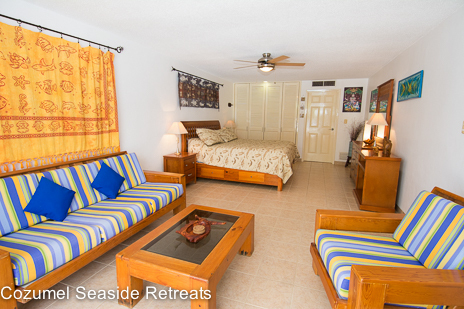 Miramar Condo 204 is a lovely 1 BR oceanfront Cozumel’s condo situated one floor up from the pool level; Miramar building is one of the finest Cozumel’s lodging option in the north shore of the island. 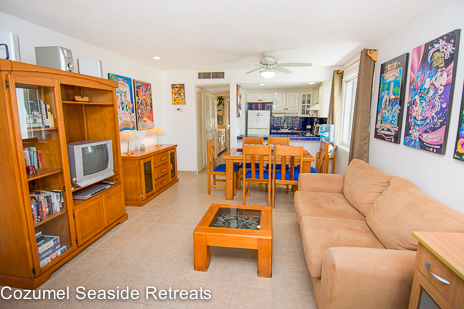 This one bedroom Cozumel’s Condo has a living area, kitchen, dining area, oceanfront LARGE bedroom and private bathroom. Just off the living area is a dining area that can seat 4 people. There is additional seating for 3 people at the lunch counter off the kitchen. The kitchen is fully equipped so you can prepare a full meal. The bedroom has a king bed as well as a sleep sofa. 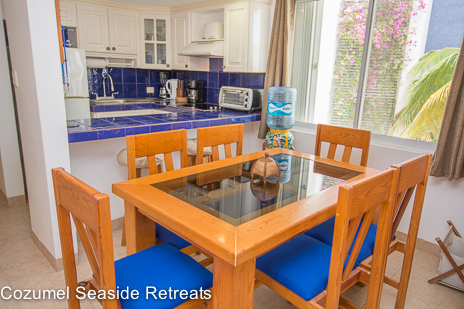 The seating area in the bedroom overlooks the ocean and sliding glass doors lead onto the oceanfront patio. THIS IS A NON-SMOKING CONDO INCLUDING THE OUTDOOR BALCONY. No additional guest occupancy (children over 1 year of age are considered in the head count). Prices do not include local taxes and PayPal fees. Contact us directly!! – no middleman. 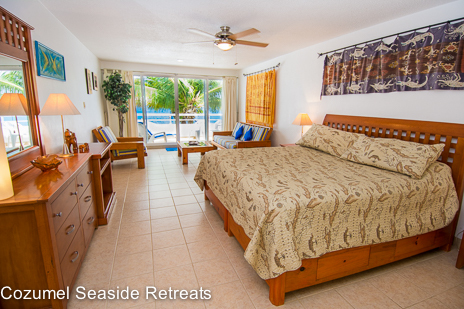 Escape the crowds of the Cozumel Hotels and relax in your very own direct Cozumel Ocean Front Condo. 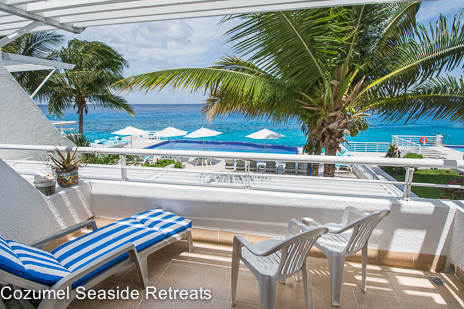 With easy access to Cozumel’s town, excellent offshore snorkeling and fabulous sunsets over the ocean, Miramar condos makes the perfect retreat for your holiday. Unlike many high rise complexes, Miramar with just 12 units, has a wonderful intimate atmosphere where you can relax in peace and quiet by the ocean front swimming pool. It was easy to book the property online and all queries were answered via e-mail. Easy key pick up and access to the property. Friendly and excellent service. I thoroughly enjoyed my stay at this lovely, clean, sunny and very quiet condo. when looking out the sliding glass window that leads to the balcony, I saw blue, blue water. The staff are attentive and available. It was a wonderful stay for me. Lilli C. / What a find! This was our third stay at Miramar and can't say enough. 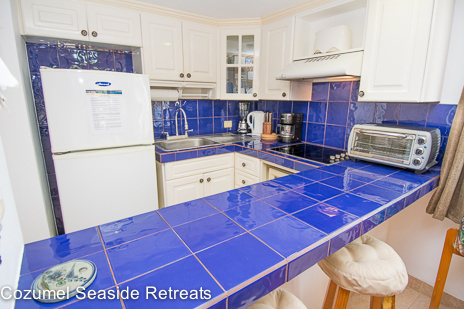 Miramar #204 is so very nice, clean, cheerful and with the ocean at your feet. We snorkeled every day and saw great sea life - eels, schools of fish, flying fish, coral, drum fish - it's incredible and so close. Then we relaxed in the pool. Our favorite part of Miramar is that there are a small amount or quests and the groups are very quiet and peaceful. The kitchens are stocked well for cooking. And we LOVED the direct, free phone line to the US. We only used it twice, but it's nice to know that in an emergency folks from home can reach us. We stayed in 204 and #202, both lovely. Also, the beds are soft as clouds. 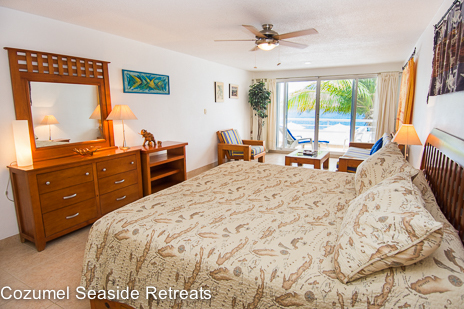 We often slept with the slide door open to hear the sound of the waves and the ocean breeze. Truly lovely. We have the vacation of a lifetime. The location of the condo was perfect, the view of the ocean breath taking. The sunset is beautiful. The private patio was perfect for a great meal prepared in. A few steps away was a beautiful pool, and a few steps down you can swim in the ocean, that was warm and inviting. we will definitely return to Miramar! This our 4th time at the Miramar, first time in the 204! As always the staff was wonderful to deal with and we enjoyed the condo very much. Quiet clean the pool and view are fantastic. Cannot say we have any complaints. Damian S. / Great ! We just completed our third stay in a row at Condominios Miramar on the island of Cozumel and booked a condo for next year immediately after we arrived back home -- we love it that much. 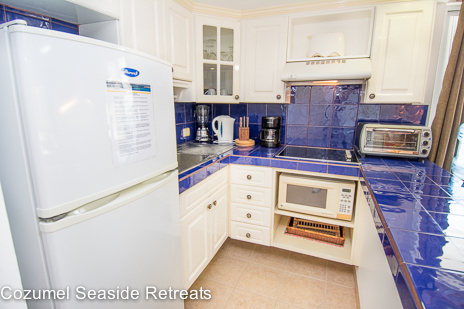 For three consecutive years, we've stayed in three different units in this very small condo complex about a 30-minute walk north of town and it's our number one choice for accommodations on the island. 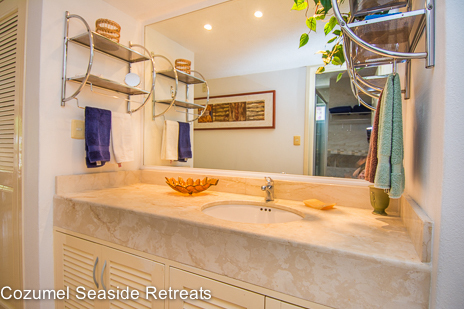 The condos are spacious, clean, well-maintained and views of the ocean are spectacular. We liked Miramar in particular because it's perfect for two adults, it's one level with entrance at street level in front and on the second level in back on the ocean side. The housekeeping and maintenance team are the best. Hard working, very friendly and they seem to enjoy our sincere and continuous attempts to improve our Spanish language skills! If you stay in any of the condos at Miramar, please be generous with tipping the maids and the maintenance crew. They work so hard to keep the place spotless and inviting -- they deserve the extra "thanks." Joyce met us at the condo and showed us all the nice features. It's on the north side of town by about a mile, so you could walk to town, but we rented a car. It is a split level condo so when you go to bed, you have privacy from the people watching tv downstairs. dvd's if Mexican tv isn't your thing. Wifi in the living room with a router allowed me to bring and use my roku for netflix. The view from the living room and master bedroom of the ocean and the sunset is absolutely spectacular. Fully stocked kitchen with toaster, blender, water bottles, corkscrew, all the things you need.I would say this is the best find in my 30 years of visiting Cozumel. I booked the Miramar Condo for my stay on the island while competing in the World Triathlon Championships. It was in a perfect spot away from the crowds of San Miguel and the resort hotels. It was slightly further away from town than we thought [30mins walk] but taxis were cheap and plentiful and as we both had bikes it was not an issue. The condo was very clean and comfortable once we had managed to turn the air-con on ! 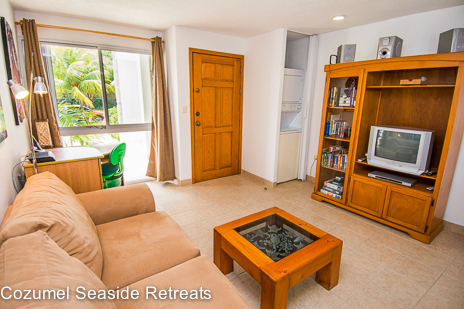 Facilities in the condo and surroundings were very good with swimming available in the pool or the ocean [be aware that there is a strong current in the ocean and weaker swimmers should restrict themselves to the pool] The only piece of equipment which threatens the 5 star review is the old ,poor quality TV. I enjoy watching sport and the picture quality on this one was very last century.Apart from that ,everything was perfect with a great view,cooking facilities if needed and friendly ,helpful staff on hand. On the few nights that we did not go into San Miguel ,the nearby Hotel B was handy for a pleasant evening meal and drink. I thoroughly enjoyed my stay at this lovely, clean, sunny and very quiet condo. It's on the water's edge, with a lap pool also in view, so when looking out the sliding glass window that leads to the balcony, I saw blue, blue water. It's about a 30-45 minute walk to town. For the price, the accommodations can't be beat. The staff are attentive and available but without being at all intrusive. It was a wonderful stay for me. We loved being right on the water and able to snorkel. The jumping platform was fun and the pool felt great. The have water that is filtered and cold. It doesn't get better. We also like that it was away from town. It was very quiet and very well kept. The best part had to be the view every morning and afternoon. It was beautiful. I highly recommend this place.